In case you haven't been made aware of this book (I've seen it praised on other blogs), I thought I let you know first hand what a great book this is. I picked it up for my guys after briefly thumbing through it, but little did I know just how popular it would be with them. My husband has been quite impressed with the variety of information contained within its pages and has been sharing aloud in the evening - everything from how to tie knots to true adventure stories. 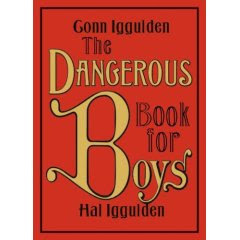 I also like the pages containing Latin phrases "every boy should know" along with the speaking in code and even the essential items every boy should have (traditional male items such as a penknife, fish hook, matches, magnifying glass etc. and then surprisingly a sewing needle and thread... hmmm... good! Boys should know how to sew!) There's lots of fun ideas, activities and good information covering a scope of topics (from astronomy to the declaration of independence). All in all, a good purchase, a fun read and something that is getting a lot of attention in our household this summer. Glad to hear your boys like it as that means mine likely will too. I have it coming from the library but do you think it is one of those ones that you really need to own? If so, where did you get it? You actually should be able to guess where I bought it since you know me so well. Yep, another Costco purchase. I conider this book a keeper for all the myriad of neat info. all in one handy volume.